What will I do at Camp Koolaree? Campers enjoy a safe and compassionate environment without worrying about bullying, competition, exclusion or denigration. All are valued and welcome for fun and personal growth in a camp where mutual respect and integrity is fostered and celebrated. While Christian in orientation, the camp provides a God-centered focus through experiences in nature and experiences with others in community. Campers learn that the principles they live by at camp can be used in their regular lives after they leave, to help create a happier and healthier world for all. 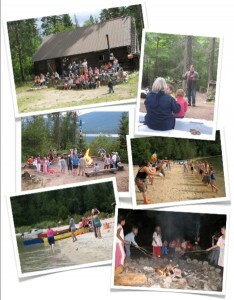 Visitors will be charged for meals and boat transportation to and from the camp. Enquire about rates beforehand. aerosol cans of any kind, money, food, pets, CD, MP3 or DVD players, electronic games, radios, fishing tackle, knives, cell phones. To ensure that everything comes back home, we suggest you use waterproof pens or sew-on labels to mark all items with camper’s name. Camp Koolaree staff cannot be responsible for lost of stolen personal property.